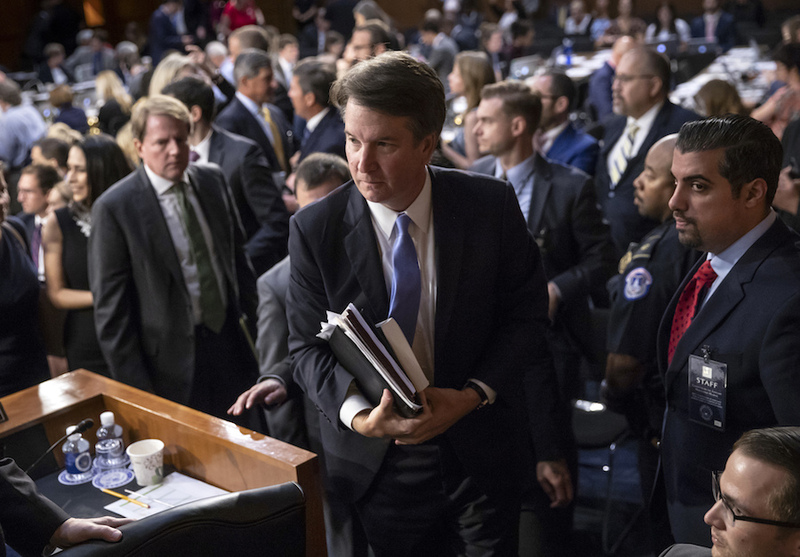 WASHINGTON (CN) – Concluding a four-day confirmation hearing, supporters of Supreme Court nominee Brett Kavanaugh praised the judge’s temperament and legal mind Friday, while witnesses opposing him warned senators he would be a consistent vote against abortion, voting rights and affirmative action. The Senate Judiciary Committee finished their public questioning of Kavanaugh around 10 p.m. on Thursday, the second consecutive day of questions that ran well into the night. Like most judicial nominees, Kavanaugh largely avoided discussing his personal views on legal issues, instead promising to remain independent if confirmed to the high court. Friday’s session began with testimony from two representatives of the American Bar Association Standing Committee on the Federal Judiciary, which unanimously rated Kavanaugh well-qualified. Coupled with reviews of Kavanaugh’s record on the bench, the committee’s review yielded praise for Kavanaugh’s temperament, professional qualifications and integrity. John Tarpley, the group’s principal evaluator, was careful to note, however, that the review did not consider how Kavanaugh might rule on specific legal issues likely to go before the Supreme Court. Tarpley specifically praised Kavanaugh’s writing ability, saying he has great skill in clearly explaining complicated legal issues in opinions. He also said the review gave Kavanaugh high marks for his personality and professional qualifications. “Given the breadth, diversity and strength of the positive feedback we received from judges and lawyers from all parts of the profession, the committee would have been hard-pressed to come to any conclusion other than that Judge Kavanaugh has demonstrated exceptional professional competence,” Tarpley said. Luke McCloud, a former Kavanaugh law clerk who went on to clerk for Justice Sonia Sotomayor and now works at the firm Williams & Connolly, praised Kavanaugh’s efforts to hire minority law clerks. Kavanaugh explained earlier in the hearing he undertook this effort in response to learning that Supreme Court justices were having a difficult time making their clerk teams diverse because they hire from lower courts. Maureen Mahoney, who worked with Kavanaugh in the U.S. Solicitor General’s Office, echoed this praise of the judge, saying he has served as a mentor to many female lawyers attempting to break into the male-dominated top of the field. Akhil Amar, a law professor at Yale who described himself as a “liberal Democrat,” praised Kavanaugh, saying his originalist approach to the law might make him a more palatable vote for liberals than even Justice Anthony Kennedy. Those lined up against Kavanaugh included Representative Cedric Richmond, a Democrat from Louisiana who chairs the Congressional Black Caucus, and John Dean, who served as counsel to President Richard Nixon. Recalling President Donald Trump’s infamous pronouncement during the 2016 presidential campaign, Dean told senators he believes that Kavanaugh’s view of presidential power would bar the indictment of a sitting president who shot somebody on 5th Avenue. “If Judge Kavanaugh joins the court, it will be the most presidential powers friendly court in the modern era,” Dean said. Georgetown Law professor Lisa Heinzerling testified meanwhile that Kavanaugh will find minds friendly to his views of executive power when he is confirmed. “There will be a clear five-justice majority for what I consider to be quite extreme views of presidential power,” Heinzerling said. Dean also echoed concerns from Democrats about the Senate’s lack of access to documents from Kavanaugh’s time working in the George W. Bush White House from 2001 to 2006. Bringing up how sexual-harassment allegations levied against Justice Clarence Thomas during his nomination process have followed the justice for his whole career, Dean said leaving parts of Kavanaugh’s record hidden before confirming him could have damaging repercussions for years. Richmond raised concerns about Kavanaugh’s record on voting rights, affirmative action and criminal law. He warned that the Supreme Court’s historic role in protecting minority rights could be jeopardized if Kavanaugh wins confirmation. “In many cases, the high court has acted when Congress has neither the courage nor the will to act,” Richmond said. Meanwhile, NYU Law professor Melissa Murray said Kavanaugh would threaten Roe v. Wade, calling Kavanaugh’s nomination the culmination of a conservative effort to break apart Roe “incrementally” without directly overturning it. “And make no mistake about it, a vote for Judge Kavanaugh is a vote against Roe,” Murray said. Murray pointed to Kavanaugh’s decision in Garza v. Hargan, in which a D.C. Circuit panel on which Kavanaugh sat overturned a lower court order setting a timeline by which the government was to allow a teen who was in the country illegally to have an abortion while in federal custody. The teen’s guardian, Rochelle Garza, testified at the hearing Friday as well, telling lawmakers the D.C. Circuit opinion put unnecessary roadblocks in the way of the teen. Kavanaugh penned a dissent when the full circuit reversed the panel’s original holding, and Murray further told senators that his opinion did not engage with key Supreme Court precedent or consider the burden the government had placed on the teen seeking an abortion. The Senate went on to hear from a third panel of witnesses opposed to Kavanaugh’s nomination. Aalayah Eastmond, who survived the shooting this past Valentine’s Day at Marjory Stoneman Douglas High School, described her experience taking shelter under the body of a classmate during the carnage. “As you make your final decision, think about it as if you had to justify and defend your choice to those who we lost to gun violence,” Eastmond said. Kavanaugh’s dissent in a D.C. Circuit case that upheld Washington D.C.’s ban on assault weapons has been a focus of the hearings this week, with lawmakers saying it shows Kavanaugh would be a vote against gun control on the Supreme Court. The third witness panel also included two people with serious medical conditions. Jackson Corbin, a 13-year-old with Noonan Syndrome, spoke to the concern that Kavanaugh would be a vote against upholding protections for pre-existing conditions included in current health care laws. “If you destroy protections for pre-existing conditions, you leave me and all kids and adults like me without care or without the ability to afford our care, all because of who we are,” Corbin said.